A 13-year-old girl presented with abdominal pain and increasing girth. Ultrasound revealed bilateral ovarian masses adhered to sigmoid colon, which showed thickened and ulcerated lesion. Unilateral (right) ovary was removed for histopathologic evaluation. We received a resected specimen of unilateral ovarian tumor measuring 11 × 8 × 6 cm. It was externally bosselated, capsulated and without capsular breach [Figure 1]a. The cut surface was a solid, with mucinous areas in it. Microscopically, it showed predominance of signet ring cells, foci of glandular differentiation and solid sheets, with areas of extracellular mucin including mucin lakes [Figure 1]b-d. A diagnosis of Krukenbergs tumor (KT), possibly caused from metastasis from sigmoid colon, was made. The distinction between a primary ovarian mucinous carcinoma and a metastatic mucinous carcinoma may be difficult. A constellation of clinical, gross pathologic and morphologic features is used in this distinction. One of the most important morphologic features suggesting a metastatic mucinous carcinoma in the ovary is the presence of signet ring cells; these are considered rare in primary ovarian mucinous tumors. Features favoring a primary rather than a metastatic neoplasm are unilateral tumor, low stage, background of adenofibroma or cystadenoma, and an absence of features which are characteristic of secondary mucinous carcinomas in the ovary, such as surface tumor deposits, a nodular growth pattern, and lymphovascular permeation. Immunohistochemistry is of limited value because of overlapping immunophenotype between a primary ovarian mucinous tumor and a metastasis from the stomach, pancreas, biliary tree, appendix, or colorectum, the most likely primary sites for secondary exhibiting similar features. Krukenberg tumors are usually seen in the fifth decade of life, with an average age of 45 years. To the best of our knowledge, this is one of the rare cases of KT presenting at such a young age. Gupta et al. published a report of a case with an average age of 20 years.Because of its poor prognosis, an early diagnosis and treatment is paramount. Awareness of its occurrence in younger patients would help in timely detection. Sincere thanks to Dr. Aparna Ahuja, Dr. Simi Bhatia and Executive Director, Dr. Amar Dasgupta, for their constant support and guidance. 1. Al-Agha OM, Nicastri AD. An in depth look at Krukenberg tumor: An oberview. Arch Pathol Lab Med 2006;130:1725-30. 2. McCluggage WG, Young RH. 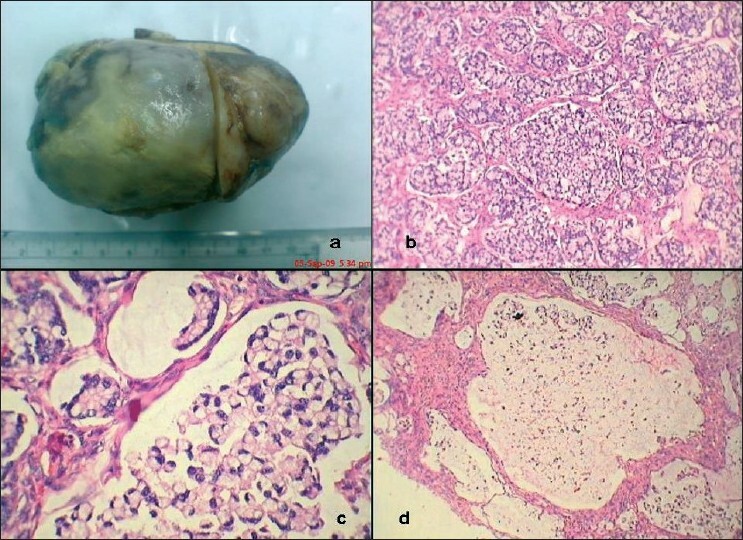 Primary ovarian mucinous tumors with signet ring cells: Report of 3 cases with discussion of so-called primary Krukenberg tumor. Am J Surg Pathol 2008;32:1373-9. 3. Gupta P, Snebold MA, O'Donnelly S. Krukenberg's tumor in the young population. J Am Osteopath Assoc 1989;89:500-2.